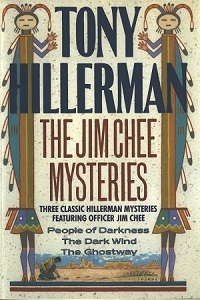 In People of Darkness, officer Jim Chee is forced to use all of his powers of dedication and insight to extricate himself from a deadly series of incidences involving a mysterious millionaire, a sinister peyote-eating Indian cult, and a murder. In The Dark Wind, a seemingly routine stakeout at a vandalized windmill thrusts Chee into the center of a dangerous web of drugs, witchcraft, and betrayal. Finally, in The Ghostway, a felon relocated under the Federal Witness Protection Program sets off a chain of treachery and killings, and only Chee has the knowledge of the people and the landscape to understand the clues.